How are potentially vulnerable packages shown? Can my build fail when such packages are consumed? Note: This method of scanning vulnerabilities is outdated. Check out our integrated vulnerability report for a better way of analyzing potential vulnerabilities. Use of libraries with known vulnerabilities can be an issue for software and components you create: check the excellent whitepaper "The Unfortunate Reality of Insecure Libraries". In the OWASP Top 10 2013, consuming vulnerable packages is listed under A9 Using Known Vulnerable Components. 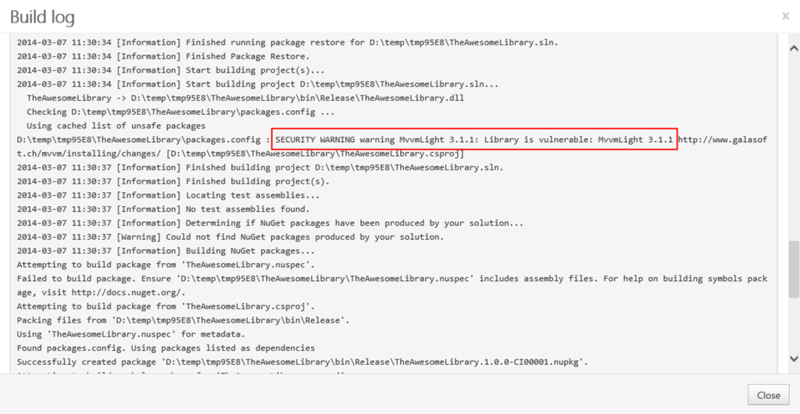 Automatic checking for known vulnerabilities can be done: OWASP has released a NuGet package which is able to check known vulnerabilities in other NuGet packages. The SafeNuGet package contains an MSBuild task which will warn you about consuming such packages. This will add a .targets file to all projects in the open solution, adding a check for possibly vulnerable packages during build.